Owned, not eaten. Good to know. He loves his presents. He even greets us at the door with a toy in his mouth. I didn’t know it at the time, but it was the weekend of National Dog Day. 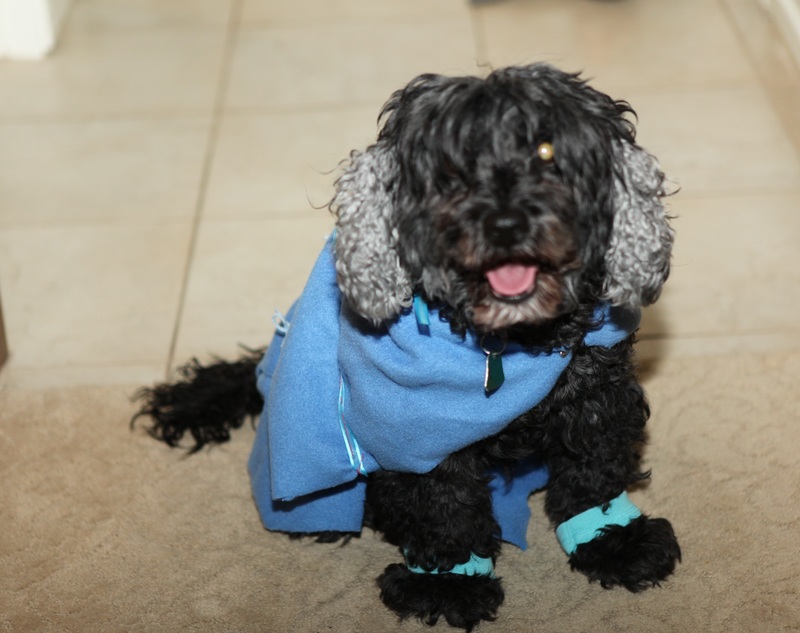 This post is a couple of days late, but it’s a tribute to my own crazy dogs. 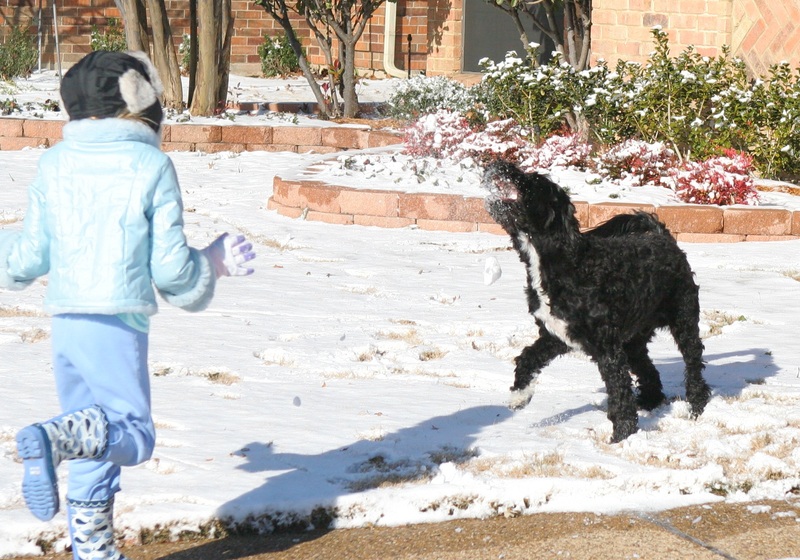 We got our Portuguese Water Dog when he was 3 months old and the Daughter was 3 years old. He’s 11 now. His breeder told me that he was the most laid back PWD that she’d ever seen in all her years of breeding and showing. He is a fabulous dog. 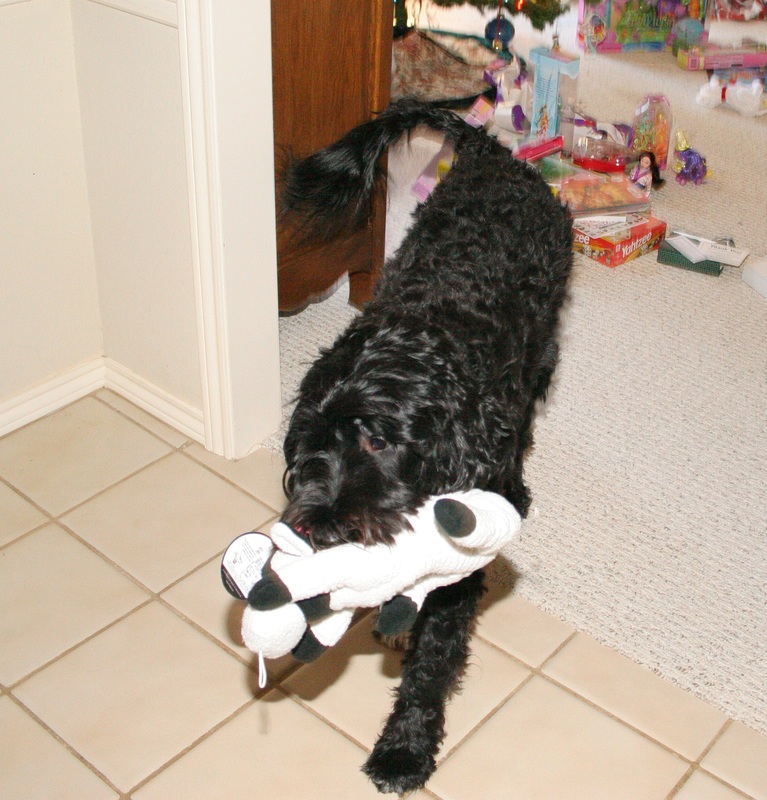 Now before you go out and look for one for yourself, Portuguese Water Dogs are not easy dogs unless you train them and work them. They will counter surf (if the muzzle can reach it, it’s snack time), they can be willful, and they must be groomed regularly. Positive feedback obedience training is the best. Believe me, I did both kinds of obedience. The choke collar training didn’t work–I don’t care how recommended the trainer is. I also trained with him in agility for several years (that’s a story for another time). He LOVES snow and catching snowballs. He loves to hug. He leans against my leg and sighs. Sweet dog. He’s a clock. He knows when it’s 7 AM (breakfast), 5 PM (dinner), and 8 PM (treats). Any other time on the clock is fair game for T-R-E-A-T-S. He can spell. We had to stop spelling words, such as “treats,” “walk,” and “bath.” Now we just make up words and use sign language (but only if he isn’t looking). He has rat radar. If a rodent tries to live near our house, he lets us know. He can’t stand them. He tore up a bush in the front flower bed to expose a nest. *shivers* The Husband sends him out on recon missions from time to time to be sure we’re rat free. She’s really an Ewok in disguise! She’s just the right size for Daughter 2 to take on a walk. 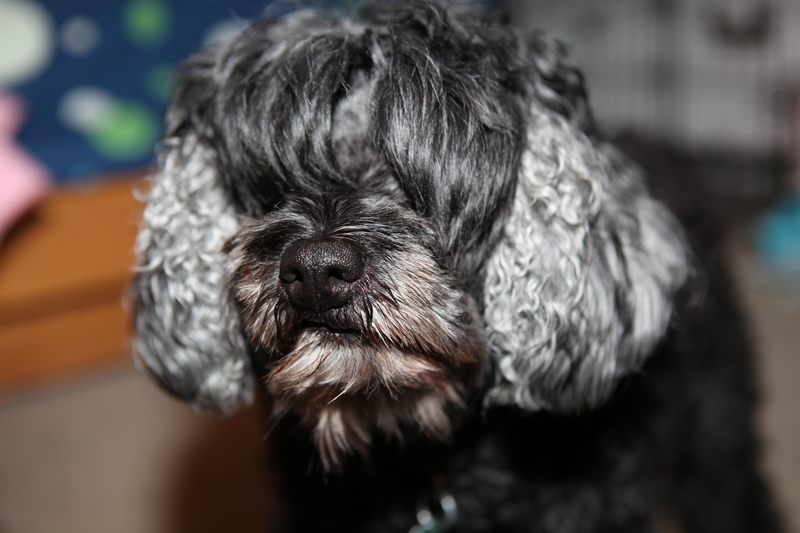 She’s smart in one way: She has picked up every begging habit that the big dog has. Other than that, she’s not very bright. Cuteness makes up for that. She’s a clothes horse. Can you say, “Dress up time”? She loves attention. She is always nearby. We just have to watch that we don’t step on her. She herds her owner (Daughter 1) when it’s time for food or walking. She is the big dog’s minion.